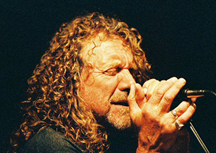 A possible rift between Robert Plant and Jimmy Page might be setting another obstacle in front of the chances that a Led Zeppelin reunion tour will become a reality. It has been reported that Page failed to mention Plant’s name during his recent acceptance speech during the MOJO Awards. MOJO is a U.K.-based music magazine. Since Page delivered a rather lengthy acceptance speech and the award was bestowed upon the entire band, Plant is said to be upset that his name was not mentioned once. Plant, as most fans are aware, is touring with Alison Krauss, and was not able to attend the awards ceremony. The award that Led Zeppelin was honored with was for “Best Live Act,” which was in recognition of the group’s performance late last year at London’s O2 Arena. I like Led Zeppelin a lot.In fact they are my favorite band.I wish they would stop keeping everybody hanging & jerking us zep fans off.If Robert Plant dosen’t want to get back together,be honest with the rest of his former band mates& & let us& (the fans)them(Pink Floyd)lol know whats going on.These stupid things like he didn’t mention my name or this or that.The bottom line is thinking of an exuse for not getting back together is easy or jerking everybody off.Guys if u wanna get back & make together real cool.If not thats cool to.My point is one day we are all going to die & some might have regrets.I hope that dosen’t happen any time soon. Arrogance as well as ego go hand in hand with musicians stupity does not!!! These men know exactly what they are up to and will play it out well with us as they see fit! This band is the only band in the history of Rock to do what they darn well please and not care one bit what we as fans think! Carmen your obviously a Plant fan, thats great, i have beeen too at times. maybe his name should have been mentioned, on the other hand, if he cared THAT much, why wasnt he there?. It begs the question to ask that because he DOSENT care that much. Also, Plant did not “write” msot of the songs. He is not a compser and he dosnt have that kind of ability. He DID pen the lyrics to quite a few Zeppelin songs, but that HARDLY means he”wrote most of them” He also “borrowed” quite a few lyrics from other people. A habit of Roberts which got Led Zeeppelin sued a couple of times. this is ironic because PAGE always gets the blame for being a “plagarist”. this is usually claimed by the kind of people who make statements without basis, on issues they dont understand, and subjects they dont really care about. in my experience these people parrot the things they’ve haerd other people say, to sound intelligent.